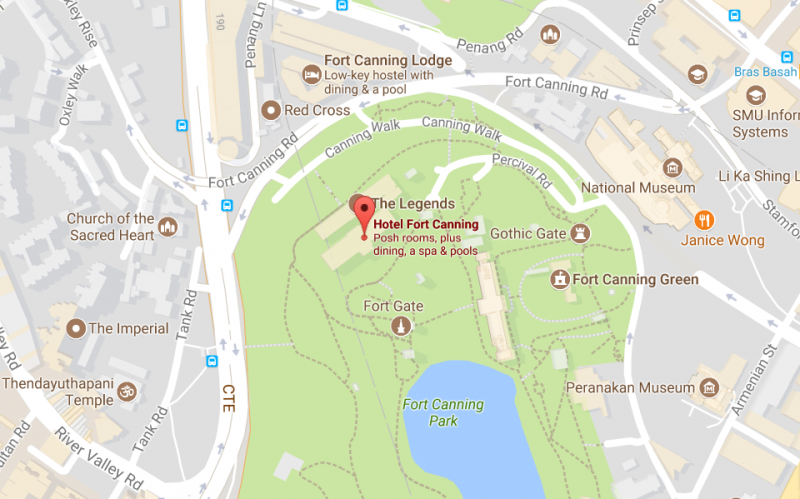 Hotel Fort Canning is based in – you’ve guessed it – Fort Canning Park which is located in the centre of Singapore. This was the last hotel of my one week trip and I can’t wait to share all the details of my stay – it has to be one of my favourite hotels ever! 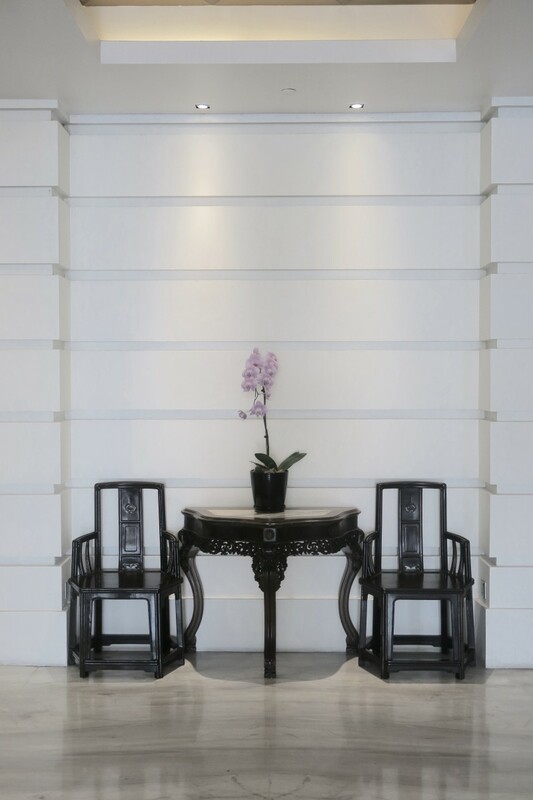 Tucked quietly amongst a lush 18 hectares of greenery, the hotel has a trendy yet luxurious feel to it. 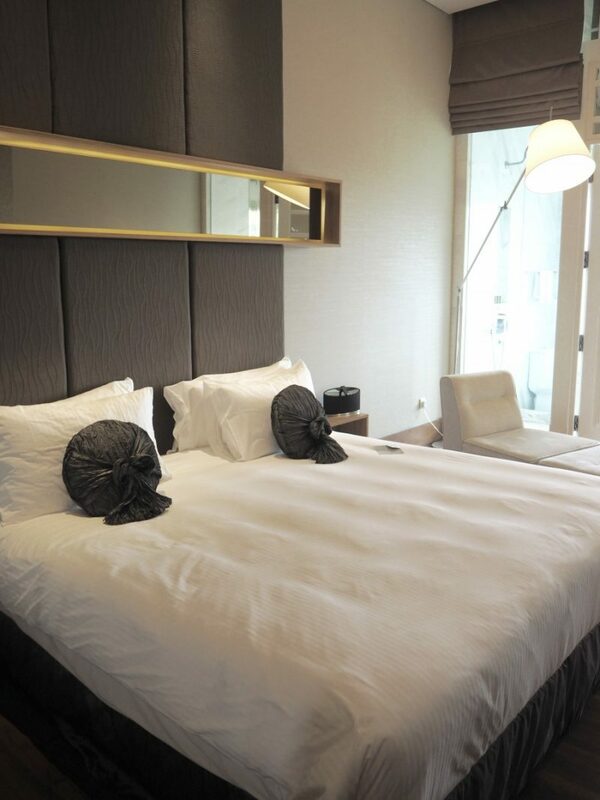 With it only being a short walk away from the heart of the city, it makes the perfect location for all travellers who want a slice of the city, but would like to escape it as the night falls. Housing myself in a deluxe room was honestly one of the best highlights of my trip. 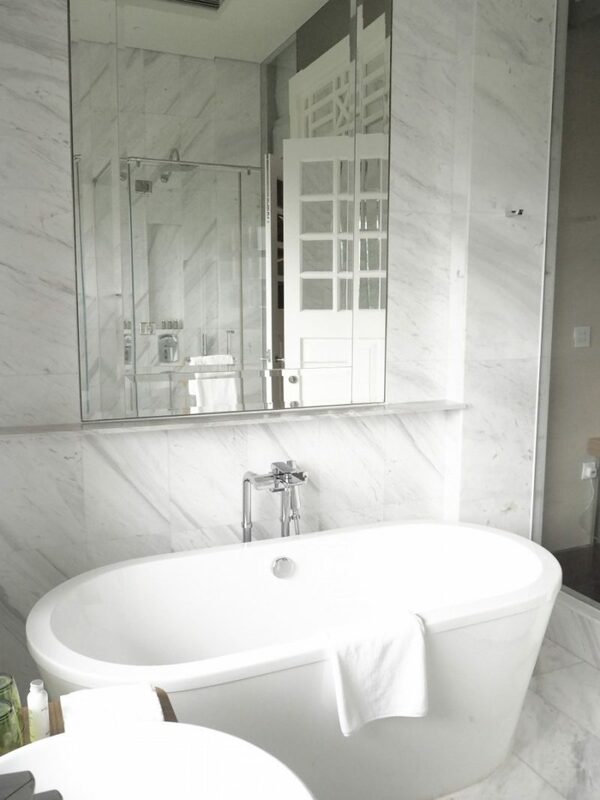 As soon as I walked in to the room, I was in complete awe of everything, from the bed to the desk area to the AMAZING bathroom, I mean can we just take a moment to appreciate the marble décor? The room itself is very spacious, with wardrobe space aplenty. 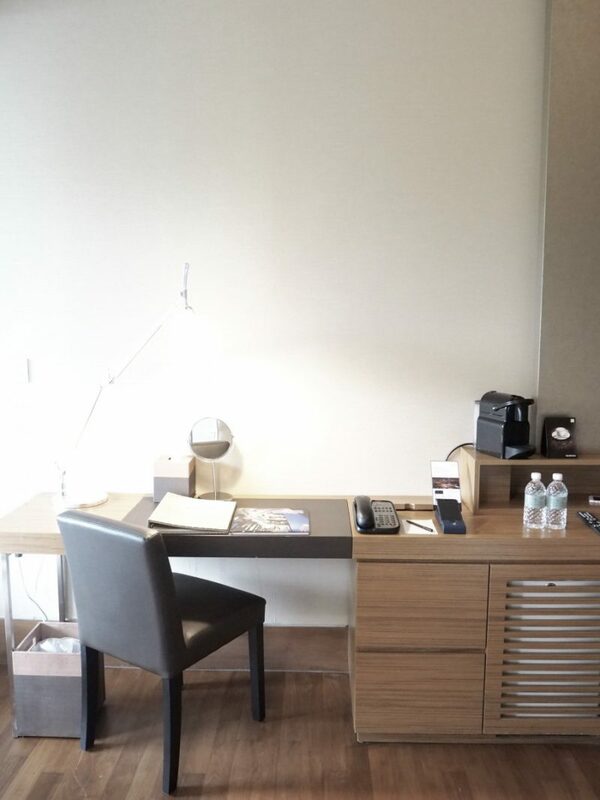 The large, king size bed is super comfy, the desk area is great for those who are travelling on business and there’s even a small, sofa/couch in the corner which is perfect for a little spot of reading. 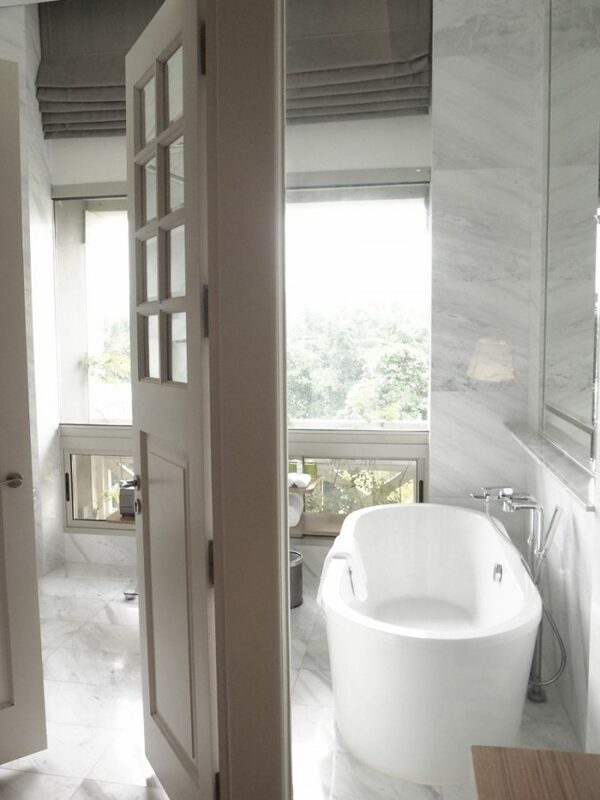 The bathroom has a shower as well as a bath tub and the view from the bathroom just tops it all off. I only stayed for one night and had a bath at 4am in the morning, it was bliss. Sadly, I didn’t get a chance to use any of the facilities, but they looked amazing still. There are two landscaped pools with sunbeds dotted around the area. The water used to fill the pools is mineral water treated by a system from NASA which is also used for astronaut’s drinking water. 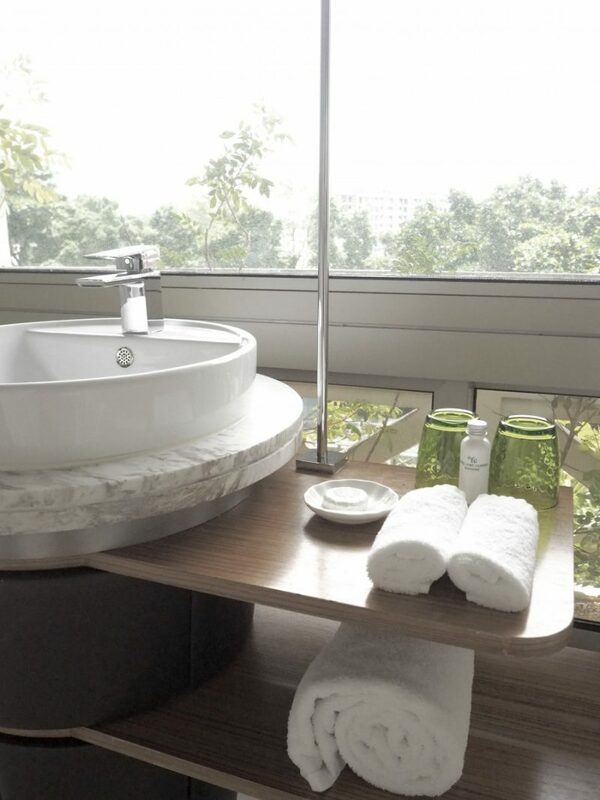 This system eliminates the scent and health problems associated with chlorine – super fancy indeed. There is also a gym and a spa adjacent to the hotel offering state of the art gym equipment and a plethora of beauty treatments. The reception area is tucked neatly to the left as soon as you walk in. 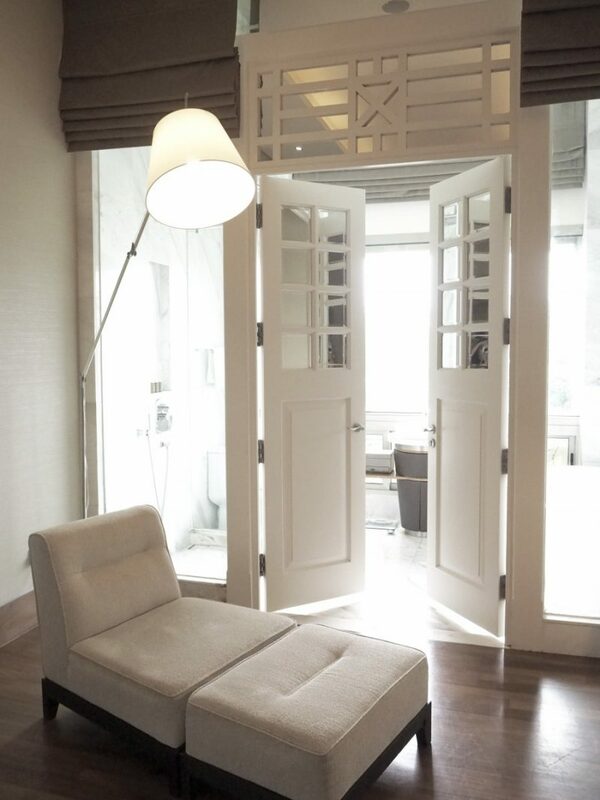 It is a ‘sit down and check in’ style which gives guests the comfort and feels more cosy and intimate. The décor of the surrounding area had a forest-ty type feel with exposed rocks, water fountains and several types of plants. On the other side of the lobby, sits the lounge bar and towards the back of the lobby area, is the open grounds where events such as weddings or parties are held outdoors. Through the open area, is also the short path leading on the main stretch of Orchard Road. 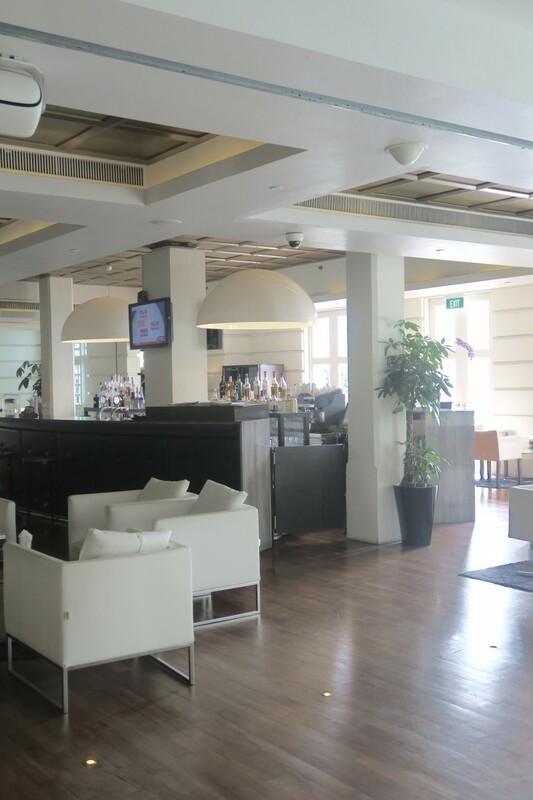 There is one main restaurant and one bar lounge situated on site. 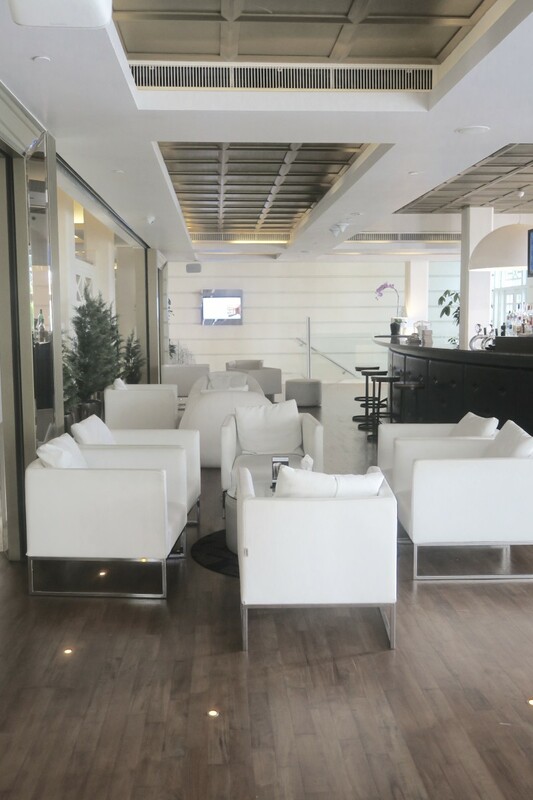 The Salon restaurant serves Western style foods, but with Asian flavours and the Tisettanta lounge bar is great for an afternoon tipple or evening chill with some friends. 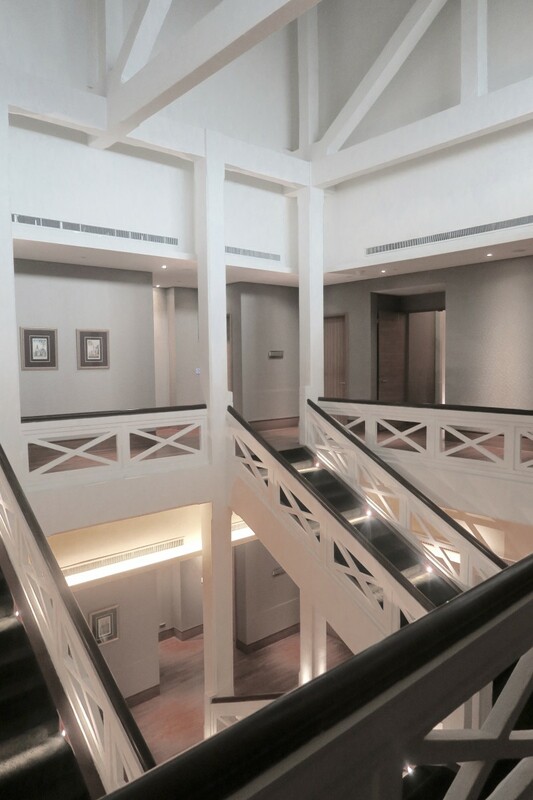 Both places are easily accessible within the hotel and open until late. 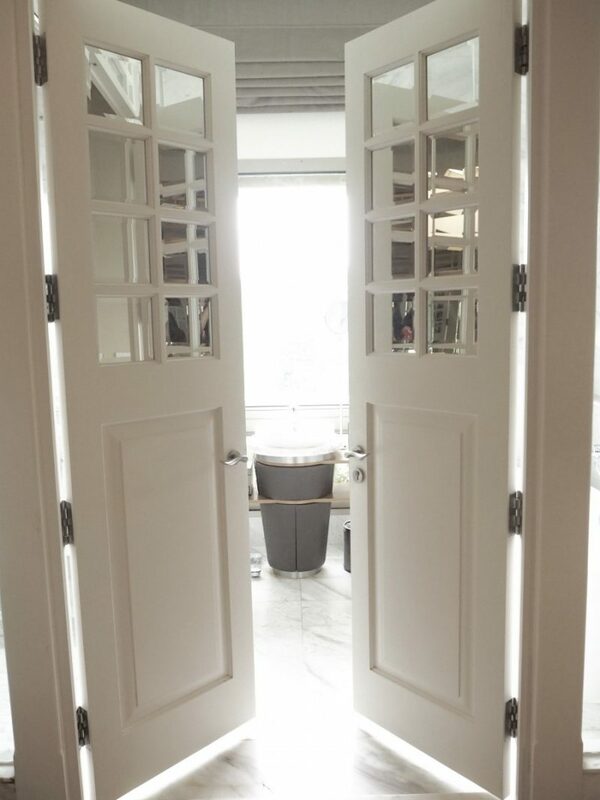 Even though I only stayed one night at Hotel Fort Canning, it was an amazing experience and I would love to go back again, even if it was just to admire the view from the insta-worthy bathroom, I’d happily do that, haa!